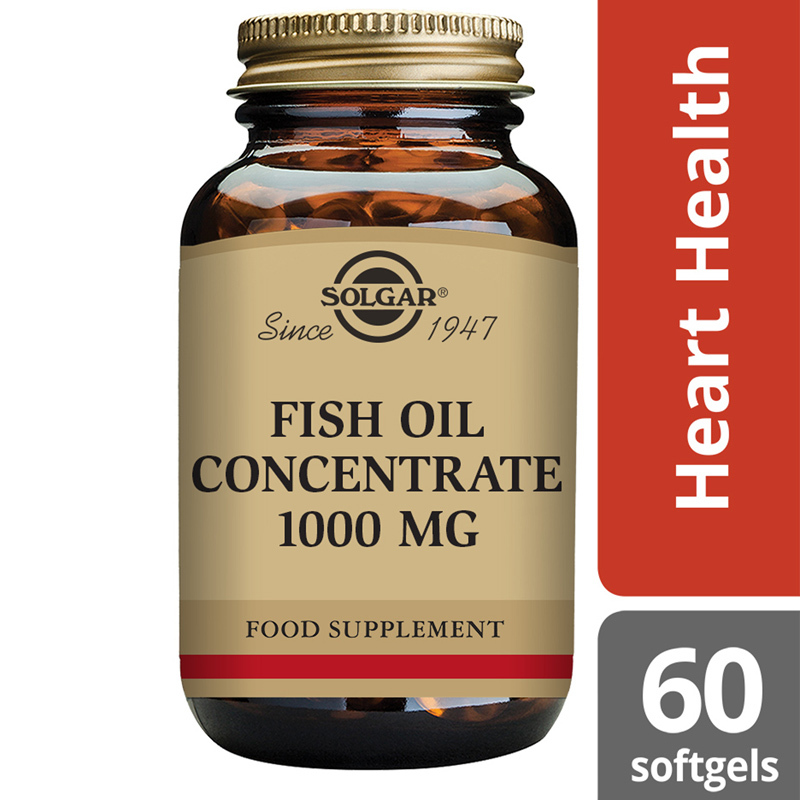 Pure Fish Oil Concentrate - A natural Source of Omega-3 Polyunsaturates Eicosapentaenoic Acid (EPA) and Docosahexaenoic Acid (DHA) as Fish Oil Concentrate from Solgar Vitamin and Herb. A rich source of Essential Fatty Acids. 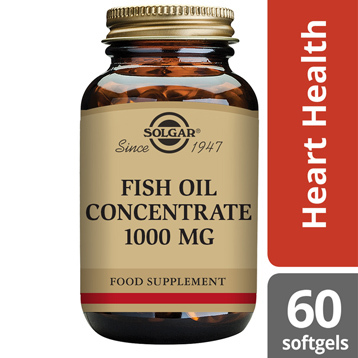 Solgar® Fish Oil Concentrate 1000 mg consists of important types of Omega 3 EPA (Eicosapentaenoic Acid) and DHA (Docosahexaenoic Acid). These are commonly found in oily fish such as sardines, mackerel and salmon. Ingredients: Fish Oil Concentrate providing: Eicosapentaenoic Acid (EPA), Docosahexaenoic Acid (DHA), Softgel Capsule Shell: (gelatin (from bovine), vegetable glycerin (from palm kernel oil and coconut oil)), Antioxidant: natural mixed tocopherols (vitamin E). 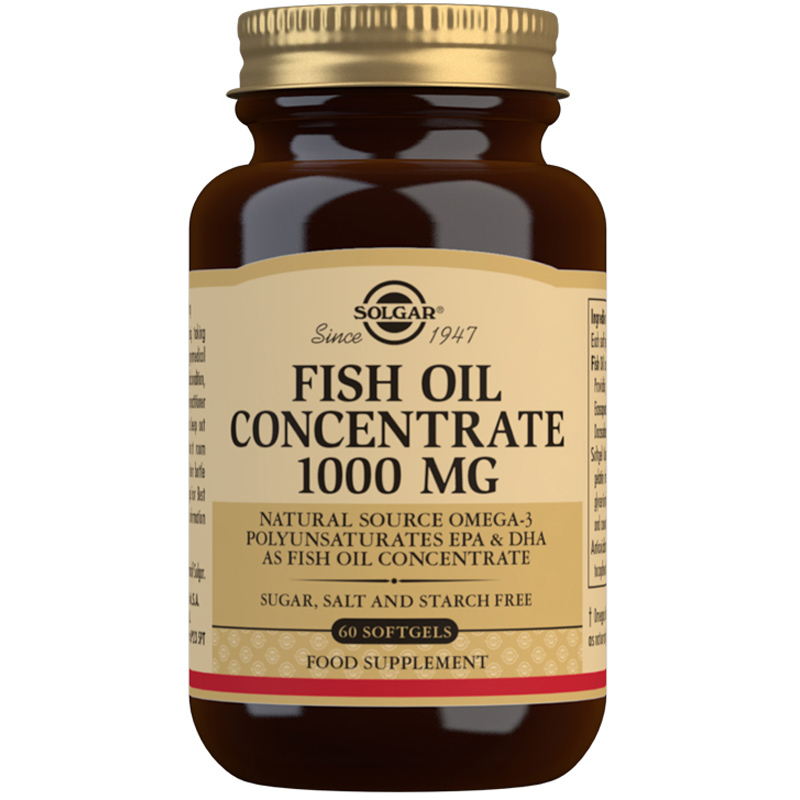 Fish Oil Concentrate providing: Eicosapentaenoic Acid (EPA), Docosahexaenoic Acid (DHA), Softgel Capsule Shell: (gelatin (from bovine), vegetable glycerin (from palm kernel oil and coconut oil)), Antioxidant: natural mixed tocopherols (vitamin E). As a food supplement for adults, one (1) softgel capsule daily, preferably at mealtimes, or as directed by a healthcare practitioner.